Richard, a long time reader, is really excited about building with rice hulls. He’s especially interested in using this method after learning from Maggi of Chiang Dao B&B in Thailand that rice hulls are more durable than previously thought. So, not only do rice hulls save lots of time and hard labor, and create a highly insulating walls, they should also last a long time with proper precautions. Richard sent Maggi a list of questions to learn more details. “The following interview is a conducted by Richard Grinchis with Maggi McKerron at her place in beautiful Chiang Dao, Thailand. Maggi is experimenting with the use of rice hulls (husks) as a building material in the construction of her accommodations for guests and workshop attendees. The use of these natural materials which have many interesting properties has always intrigued me, so I considered it a great opportunity meet up with Maggi and discuss this method. RG: Maggi, you are one of the pioneers in building with rice hulls, can you share some of your knowledge gained working with this method. Why did you choose to build with rice hulls? MM: Being British, I call them rice husks! I went on a workshop to learn how to build an earthbag dome given by Paulina Wojciechowska (EarthHandsAndHouses.org). Paulina was the person who brought earthbag building to Europe, having studied with Nader Khalili. 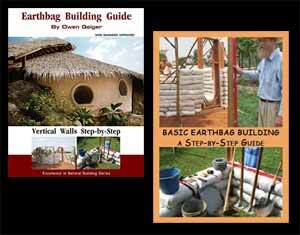 She wrote the first book on building with earthbags. But I was worried that having such a thick wall of earth it would be damp inside during the monsoon. And I was right, as I have an earthbag dome here, and although it is wonderfully cool in the dry season, it is definitely damp inside during the monsoon months. I thought about strawbale buildings which I think would be ideal here. However, we don’t have the machines in Thailand to make the bales! So I decided on rice husks in bags, giving much of the same properties as strawbales, and adding to that the factor that rice draws out moisture this makes this an ideal building material for monsoon areas. Nobody wants rice husks, apart from a very few farmers that use them for mulch, and you can see them piled up beside rice mills, where they try to burn them but they are very difficult to burn (another plus for using them as walls). They are very cheap indeed, or even free. Another wonderful factor is that they are light. You can carry a few bags at a time. Any one that has built using earthbags will appreciate this! RG: Are the rice husk bags able to bear structural loads? MM: But of course they are not load bearing. In order to use them you need to make a framework that will hold up your roof, doors, windows, etc. I used mostly bamboo and some reinforced steel bars all tied together with wire for my frame. You can see photos of this and in fact the whole process on my Blog. 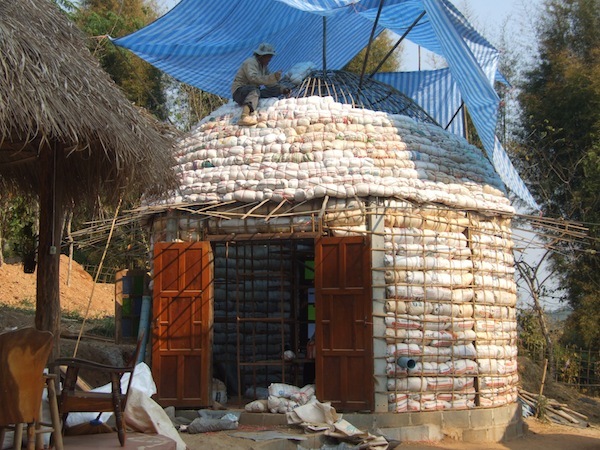 Once the foundation is laid (concrete because of termites – but reinforced with bamboo) and the framework in place, it takes about two days to place and tie all the rice husks bags to make the walls of a five metre dome, two metres 20 centimetres high. Making a dome takes a bit longer as the bags need to be smaller and longer, and tied on the outside of the frame, and on top of that I put a cap of woven bamboo and cover that with cement, then waterproofing, then another layer or two of cement – because of the monsoon again. RG: Any considerations when mounting a roof structure? MM: I have roofs of thatch and domes of rice husks with cement caps and it is stunning how much cooler the dome roof is, and how much warmer in winter (it gets cold in Chiang Dao!). RG: How about hanging things on walls (mounting fixtures, shelves, etc.)? MM: Shelves are easy to add. Just pierce the bags with a row of bamboo sticks and then weave bamboo between the sticks, add your mud mix. This works very well. They are very strong – I have lots of books on my shelves. To make something to hang things on, just use one bamboo stick and cover with mud mix. RG: Are there any special considerations for rendering the walls (mixing render, cracking around door / window frames)? MM: Everyone has their own recipes for mud mixes (renders). It depends on the earth you have available, the kind of sand, the kind of lime. We add rice husks to all mixes except for the final render. It’s very much a matter of trial and error. We are very proud of the outcome of our experiments. The finished walls are very smooth, look wonderful and there are very few cracks. One point we have noted that if the render is covering wood (as it sometimes does if you make a frame) the contracting and expanding wood will lead to cracking at that point if the wood is near to the surface. We now make sure there is a lot of mud mix on top of wood. RG: I know that you are hosting certain workshops in this method. Can you discuss some of the details? MM: We will be holding a workshop from 10 – 20 March 2015, here at Chiang Dao Roundhouses to make a Roundhouse with a Dome roof. Dorm accommodation in roundhouses will be available for 10 participants, plus meals. The cost of the workshop will be 10,000 Baht, and for accommodation and food 3000 Baht. To book a place a non refundable deposit of 2000 Baht is required with the balance due 2 weeks before the beginning of the workshop. Accommodation is available in the village if participants prefer. Contact me on maggimck@yahoo.com to book your place or to ask any questions about the workshop. RG: What will people learn during the workshops? MM: Participants will learn the whole process of building a roundhouse with a dome roof, with some theory but mostly hands-on participation in the process. The foundations will be complete before the workshop begins. Participants will build the frame, with windows and doors, and attach rice husk bags to the walls and the roof. We will make a cap of woven bamboo over the dome roof. We will mix mud with sand and rice husks and apply to the walls and inner dome. MM: No one has made a building using rice husks that has stood for any length of time. The only other structure I know of, besides my own, is just down the road! This was made in 2009 and is still fine. We don’t know what will happen after, for example, 10 or 20 years. I’ll let you know! I would like to help anyone in any country to make this kind of building, especially local people wanting to learn a viable, cheap alternative to concrete blocks or those wanting to build a habitation quickly after a natural disaster. Anyone is welcome to contact me maggimck@yahoo.com for any information or help that they might need. Note: wrap wood frames with tarpaper and chicken mesh to reduce cracking of plaster. Search our blog for more articles about building with rice hulls. Use clean rice hulls with minimal bits of grain. Plaster the walls as soon as possible. Maintain plaster so there are no wall penetrations. Richard and I have been talking about this building method via email. He pointed out how tubes would greatly speed the process, because you wouldn’t have to stop and retie the ends of bags. In Vanuatu, we’re currently using tubing that is 14-1/4” (36cm) wide when measured flat and empty. This creates a wall thickness about 12″ wide before plastering. That’s plenty of insulation. So, not only would you save time and labor, you’d also use fewer materials. This one tip could shave 1-2 days off the building schedule. It is more difficult finding tubes, however. Bags are much easier to get. If you do use tubes, all you really need is a plastic bucket with the bottom cut out as a funnel. Rice hulls are as light as popcorn, so you could go really fast and not have to work nearly as hard. Maggi lives in a very rainy climate and surprisingly she hasn’t had any big problems so far. This is very encouraging. For those who live in drier climate there would obviously be far less risk. It would be prudent to crawl around the roof every 6-12 months and inspect for any cracks just to be on the safe side. Water will penetrate even small cracks on the roof. Also, I question the necessity of using a concrete foundation just because of termites. Maybe Maggi can share her experience on this. Maybe the concrete is important for stabilizing her wall system. I would probably just use some wood posts every 6′ or so, use gravel bags on lower courses and rice hull bags on top. Building rice hull bag dome roofs is experimental and the lifespan is unknown. For an expensive home it would be safer to build a standard roof. But what Maggi has done is very important and to be commended. She’s pushed the envelope a bit to test the limits of what’s possible. Maybe she has to fix the roof in 10 years. On a small, low cost structure like this it’s no big deal really. Most people fix their roofs every 10-20 years anyway. So here’s yet another excellent way to build with bags and another way to build dirt cheap housing (my favorite topic). Special thanks again to Maggi and Richard for pulling this information together and sharing with the world.